The Whirlpool Duet Sport is skulking around the Ameedican market. The one schweet thing about this dryer is that you can get to all the guts via the top or front panels– no need to pull it out from the wall in violation of the 10th Law of the Prophecy. 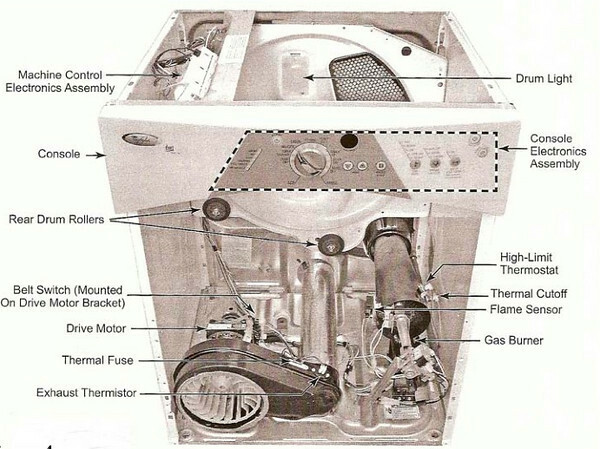 Disassembly follows the same procedure as for the Whirlpool-built dryer with the lint filter in the door, see this page. By some stroke of luck I got to work on a Whirlpool yesterday. It was a Duet Sport Dryer about 3 months old. The drum belt was broken, and I was lucky enough to have it on the truck. My first observation is that it’s sort of a pain to install. I had to take the console and front off to do it. The second issue is the spring on the idler pulley. I could not believe how strong that idler pulley spring was. It takes both hands and major strength just to push it back enough to get the belt installed. I’m serious, it really is monstrously strong. I’d guess that spring is at least 5 times stronger than the regular Duet. I’ll bet if you left 100 new ones in the box for 6 months, you would find most had broken belts just from the spring pressure on the idler. I’ll bet we will be doing a lot of these belt jobs in the near future. This entry was posted in Dryer Repair on May 31, 2007 by Samurai Appliance Repair Man.